Almost every town in Massachusetts has a Herring River or a Herring Pond or some sort of a herring run. River herring used to be ubiquitous: they returned from the sea to coastal rivers and ponds year after year in the spring to spawn. They still do, but in many places their numbers are down to single digits where they once arrived in the hundreds of thousands. There are all kinds of reasons for this: habitat degradation, barriers to fish passage, overfishing, poor water quality, by-catch during their time at sea. The pictures you see here are from the Wellfleet Historical Society. 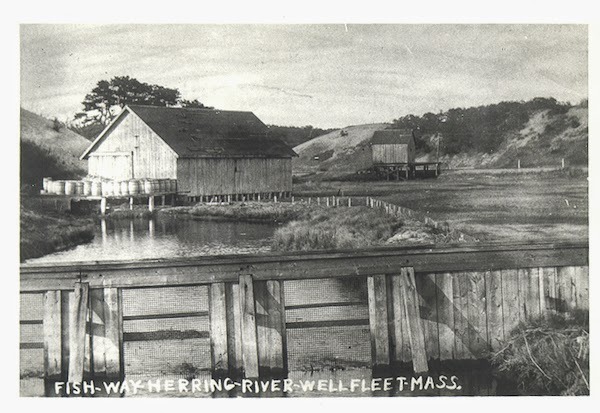 They show the Herring River in Wellfleet and herring fishery that existed before the river was diked. John Portnoy, an ecologist who worked with the Cape Cod National Seashore for almost thirty years, put together a report on estuarine management during the 1800s, and there are all kinds of interesting facts in there about the effects of the dike on the river herring. 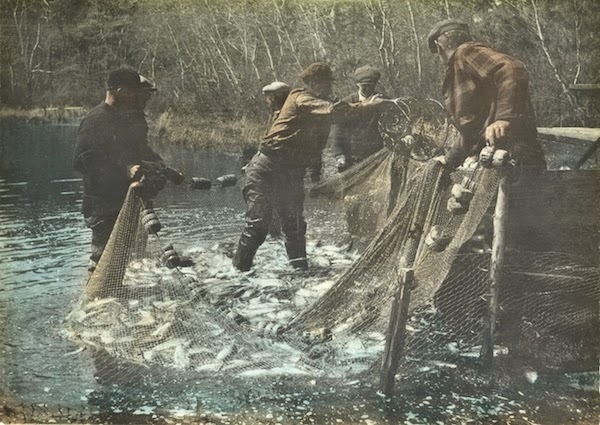 Starting in the late 1700s, the Selectmen auctioned off the right to commercially fish the river for herring. In addition, every Wellfleet citizen could take 200 fish each spring, paying 1/2 cent per fish. The town used the revenue—which was usually between $400 and $700, a fair amount of money back then—to pay the elected town officials. But in 1909, the river was diked. The idea was to control mosquitoes—following several years of heavy rainfall, the towns people were fed up with these pests. Unfortunately diking the river ended up creating more stagnant water, making the problem worse. Rather than take down the dike, the town decided to dig a series of drainage ditches in an attempt to dry out the marsh, and poured kerosene on the surface of the water to help kill mosquito larvae. Between the dike itself, which posed a significant barrier to migrating fish, and the subsequent deterioration of water quality upstream, the herring fishery collapsed. There are similar stories all over the Cape—the Association to Preserve Cape Cod has a long list of herring runs that towns are attempting to restore. The efforts start with herring counts, to get an idea of what kind of shape the river herring populations at each site are in, and then work from there to take down barriers and restore ecosystems as necessary. In Wellfleet, the Park has plans to take down the dike and restore the entire 1100-acre estuary to full tidal flow. It's going to be a long process—right now the project is in the design phase, but even once work starts on the ground, maybe as soon as 2016, those involved say it could take decades. There's a neat video about the project and the ecosystem on the Friends of Herring River homepage. If you want to learn more about efforts to restore river herring runs in your area, check out the River Herring Network. Their website keeps up with news on river herring restoration projects and counts all over Massachusetts, and is a good way to find out how to get involved.